This entry was posted in Uncategorized on January 27, 2015 by jewel. It’s official! It’s exciting! Beau’s Bridge Club has made its first official rescue! Our tale starts with Karen, one of our founders, and her long time friend who lives in Utah, Trisha. 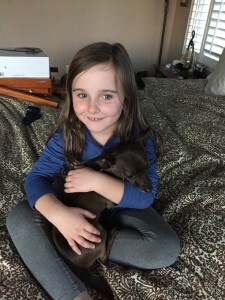 Trisha had rescued SJ, a small and sweet chihuahua, from a family in Utah who could no longer care for him. SJ was a wonderful companion and helped Trisha through some difficult times, but then her life circumstances changed and SJ ended up being home alone for most of every day. Recognizing that this was not the best for SJ, and knowing Karen’s fondness of animals, Trisha recommended that Karen could take SJ into her own home and provide him with a wonderful life. Unfortunately, Karen’s house was already full of three dachshunds, one of which does not get along with other male dogs, so it wasn’t an option to rehome SJ in Karen’s home. Karen promised to help Trisha find him a home that was able to give him the attention Trisha wanted him to have. After returning from her visit to Utah, Karen went back to work at the elementary school where she is a librarian. Knowing Karen’s fondness of animals, her principal, Anette, came to ask her if she knew of any small dogs who were looking for a home as she was hoping to add to her family. Channeling her inner Yente, Karen said, “why, yes, I do happen to know of the perfect dog for you”. There it was: the perfect dog and the perfect home. There was just one problem… SJ was in Utah and Anette was in California. Have you ever had a moment in life where all the stars just align? Everything seems to just work out? It seems too good to be true, but then it is? Well, that’s what happened in our little tale. A generous donor came forward with a gift of frequent flyer miles that would get Karen to and from Utah with SJ in tow. Like a fairy godmother, that donor was the last bippity-boppity-boo to get SJ to his happily ever after. Karen was able to coordinate with Trisha to come get SJ (and have a fun little visit in Utah) and bring him back to sunny California just in time to start his new life at the start of the new year. SJ is now named Bubba and enjoys spending his time with his family, including three 2-legged siblings and two 4-legged siblings who always keep him company. SJ is lonely no more! Sometimes it is hard to give up something you love, but being able to recognize that that is the best thing for him/her is incredibly strong. Animals end up in shelters and rescues for so many reasons, and it is easy to get in the mindset that any person who can leave their animal is wrong. Sometimes it’s just the opposite and while we hate to see animals without families, we understand that sometimes the humans are just hoping for their pets to have a better life than they can provide. If you are in this type of situation, just know that there are always resources to help. Call your local Humane Society or SPCA to see if there are options such as keeping the pet in your home until a new home can be found or, if worried about a medical problem, ask them if there are any local programs to assist in that sort of thing. Shelters are not your only option for your pet, but can almost always be wonderful starting points to help you with whatever problem you might have. We hope that you will reach out to these resources.